Due to a recent personal loss, last week I visited a funeral agency. Since this visit for obvious reasons is very much on top of my mind, I will take this opportunity to reflect upon the physical space and servicescape of the funeral office. This being my first visit to a funeral office, I did not know what to expect, more than what I had seen on tv, or a different kind of agency (general script). Physical space: The office entrance was discrete with a small waiting room. The office space had a clean scandinavian design. There were two private offices. An agent geeted us by the door, and was kind to squeeze us in on a short notice. The office room was small and overfurnished, filld with piles of paper. But there was a shelf of miniatures of coffins, which made it easier for us to pick the right model, according to our budget. Digital space: The agent used their web page as a reference, a lot of information and their enlisted products and services where easily accessed. 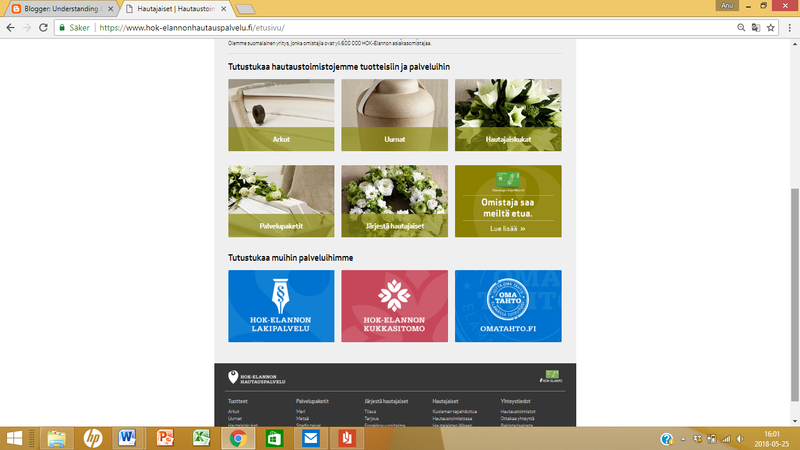 For instance, we could see a selection of floral arrangements to choose from, and then e-mail our choice to the agency. We could also have ordered directly from the web site, but I wasn’t sure that our agent would receive the information. This part could have been better informed. I’ve kept in touch with the agency after our vitit by phone and mostly e-mail. The tone of communication is professional and they answer any request quickly. The e-mail has a digital signature with logo, adress and other contact information giving it a professional appearance. Printed information: the agent showed us a selection of newspaper obituaries and selection of the available flower arrangements from handmade catalogues. These were handy for my elderly mother to read and choose from, but personally I see an opportunity to modernize the service by digitalizing these catalogues. 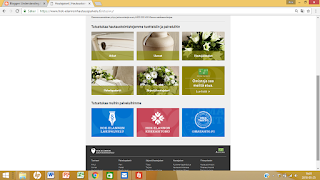 Some of the available resources in the funeral office are: the help and know how of the agent, catalogues, product miniatures and the web site. My name is Anu Majkvist. I'm an entrepreneur and networking nerd. I have started and owned different comapnies, in different areas, mostly within B2B. My full-time job today is running my firm Eldstaden- where I coach and speak about entrepreneurship and career development. I coach mostly business owners, start-ups, executives and employee-groups. My whole life I have worked in service, from grocery store, cleaning lady and shop assistant to waitress, bar tender and croupier. Later I have worked as HR-manager, market developer, KAM, consultant etc. I offer courses in customer service and relationship marketing. I love customer service and I'm very interested in what makes a happy, an loyal, customer. Resource integration gives a new perspective to how the customer's are affected and co-create value to the product or service. In her tutorial video, assistant professor Maria Åkesson decribes resource integration as how the customers interact with each other in the servicescape. Very little of this process can be influenced by the firm (open part), most of the resource integration happens without the firm's inclunece, only on the customer's terms (closed part).